inscription: An oval with "Noh Directions Press" and a union label from the Industrial Workers of the World (I.W.W.) at bottom right. Poster on white paper is printed with blue ink at right and left that transitions to red and then yellow at center. A mountain landscape with water in the distance fills the page. A sun with an eye at center appears over the highest mountain peak at top center. A vortex of swirling lines appears on the front of the mountain. 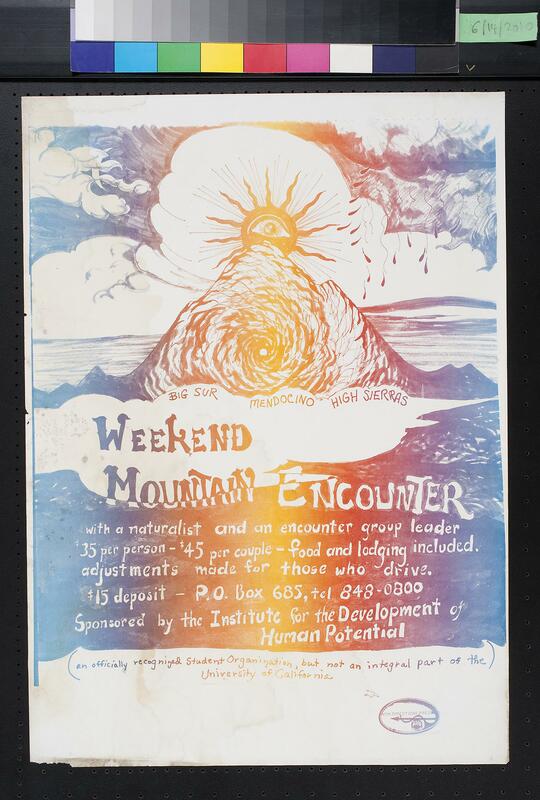 Text reads, "Big Sur Mendocino High Sierras / Weekend Mountain Encounter / with a naturalist and an encounter group leader / $35 per person - $45 per couple - food and lodging included. / adjustments made for those who drive. / $15 deposit - P.O. Box 685, tel 848-0800 / Sponsored by the Institute for the Development of Human Potential / (an officially recognized Student Organization, but not an integral part of the University of California."